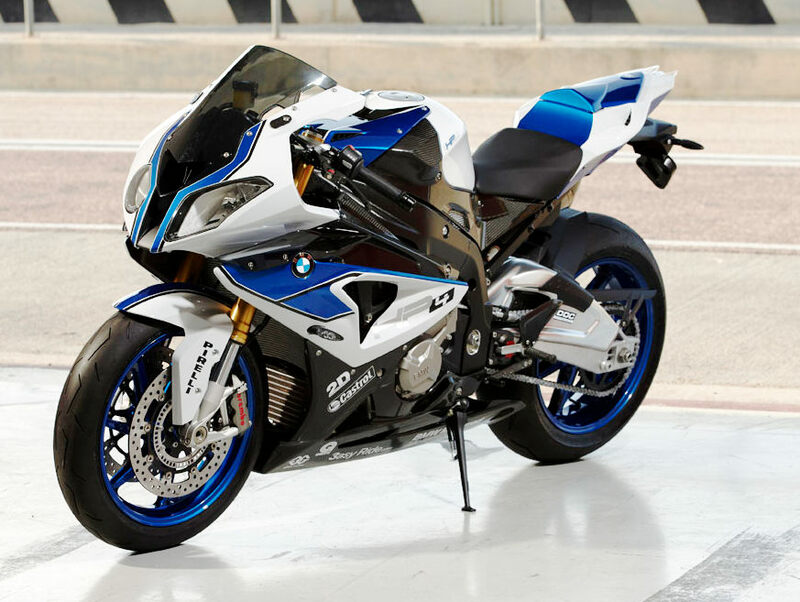 This is the new BMW HP4. Engine changes increase torque, but not peak horsepower from the standard S 1000 RR, but the big news is significant weight savings and the introduction of Dynamic Damping Control (DDC). According to BMW, “The damping is adapted to the current manoeuvre or road surface by means of sensor-supplied parameters via electrically controlled regulation valves. 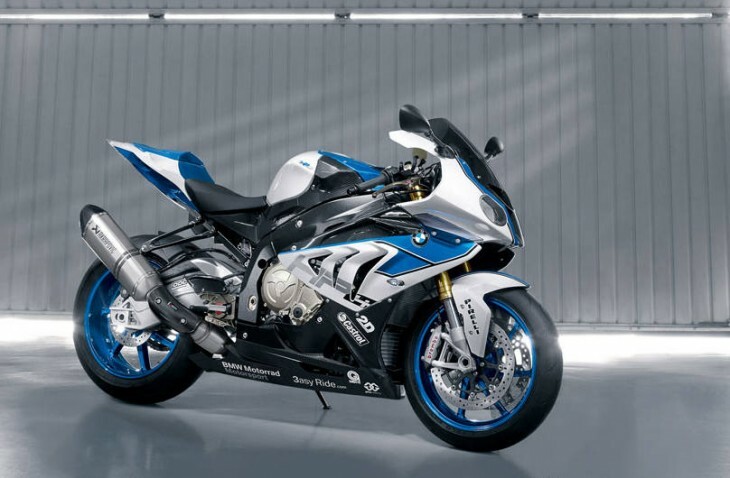 In this way, the HP4 offers optimum damping in every situation, handling long and short shocks virtually perfectly so as to provide maximum traction and safety.” Below is a list of all of the changes from the standard S 1000 RR – claimed weight drops to 436 pounds wet, in part thanks to new, forged wheels and a titanium exhaust. Lightest 1000 supersports bike with four cylinders: 439 lbs / 199 kg (90% DIN unladen weight). New rear wheel tires, 200/55 ZR 17. Forged light alloy wheels, anodized in black. They built am initial solid, winning bike (after Collins and Melandri fixed the electronics) And now they can, and will, put out an eye candy version. Does Ducati behave any differently with ‘road’ bikes that cost $40k? This is a prestige badge. For those that can afford it go nuts, otherwise, you can get the base model at a competitive price, and Melandri and Spies just might take the crown from Aprilia. I love it. I couldnt use 50% of this bikes potential with my skill set but I still love reading about the technical advances new sportbikes make. And it doesnt make me want it any less knowing I could never really use it either!! I only had a couple years of German…..while watching Hogan’s Heroes…..
for the games, these are already being used as 2-up camera bikes in place of RT’s around london. j/k. Unless you’re gonna trailer it to the track, no point in owning one of these in Dallas, Texas. We almost had a curve once, until the city planners noticed the highway engineer was drunk and sent him home……. C’mon, the best curves in Dallas are the flyovers at CentraL Expwy and 635/30/20! You’re right!!! And man! if you mess up those, you better be wearing a parachute!! Neat. Did you notice the air intake looks like and is placed where the ZX-10R’s is? I don’t mind the looks of this bike but, seriously, who needs it? anyone with a valuing mentality and functioning adrenal glands. Nice bike, but you still have to know how to ride it. A better rider on a lesser bike is still going to win. I wouldn’t want to own this bike after the warranty expires but this HP4 is amazing..must be expensive if they don’t mention the price. They’ve used the S1000RR as a loss leader to wedge their way into the market, as the price on that bike has been surprisingly affordable and close to the Japanese brands. Now I’ll bet they’re going for typical premium BMW(eurobike) 1% types with this model. Just Google “engine blowup” and you’ll see and remember everything you read on the ‘Internets’ is true! only thing left now is for WSBK to beat MotoGP to COTA…! 🙂 (wait for it, wait for it) like i said, if yamaha won’t/can’t value a 100m construction project based off a century of oil wealth…? another manufacturer sure as hell will. audi’s (theoretically) got their yank and now bmw’s going after theirs. and with that, the spillover from CARWARS continues. My thoughts exactly! I know you’re kidding but I’m not. I’d love to take a multiday trip on that thing! Never underestimate the determination of a BMW rider to turn his bike, no matter how performance focused, into a /5 with a Windjammer. I’ll bet there are people out there who are just dying to put a pipe on it. It’s difficult to claim much credit after the Germans built their sportbike on top of decades of class leading engineering, innovation, and championships by the Japanese. Adding a bits here and there is easy when one is given…err copies the winning formula. BMW is the Johnny come lately of the sportbike world. ’nuff said. Pretty sweet. It’ll carry I hefty price, I bet. If big 4 Japanese brands want to compete, they’ll have to start putting out $20K+ bikes like this, or at least close to it. Honda’s overdue for a tech upgrade, and rumors abound of a new V4 from them. how are the japanese big boys going to top this?? they always say, “it’s not about the hp, but what you build around it.” HA! BMW already did build around it and also have the most hp by 20 to boot! now they built around it even more! i know this bike will be pricey, but BMW is not letting up. i’m impress…big time! Sweet! The best open class sport bike is even better. If you guys want one, get down to your local dealer and put a deposit in now.